There are still dead bodies deep beneath the beach at Zuydcoote. When the MV Crested Eagle was sunk during the rescue of Allied troops at Dunkirk in 1940, there were 300 servicemen on board. Nearly all of them perished when German Stukas bombed the merchant vessel, setting it on fire. The men either burned or drowned. Few bodies were ever recovered. At low tide, you can still see this shipwreck, as the sea draws back to reveal its charred and rusted hulk. Here, in 2015, on the 75th anniversary of Dunkirk, a ceremony was held to honour those who lost their lives in that tragic event. It was attended by Prince Michael of Kent, who unveiled a plaque to commemorate the lives of these brave servicemen. Also present at the ceremony was a 98-year-old Royal Navy veteran called Vic Viner, whose brother Bert was one of the poor souls who went down with the MV Crested Eagle. Vic had witnessed the attack from further up the beach. Zuydcoote is not unique. All up and down this section of France’s northern coast there are reminders of the Second World War and the gruesome battles that took place here. 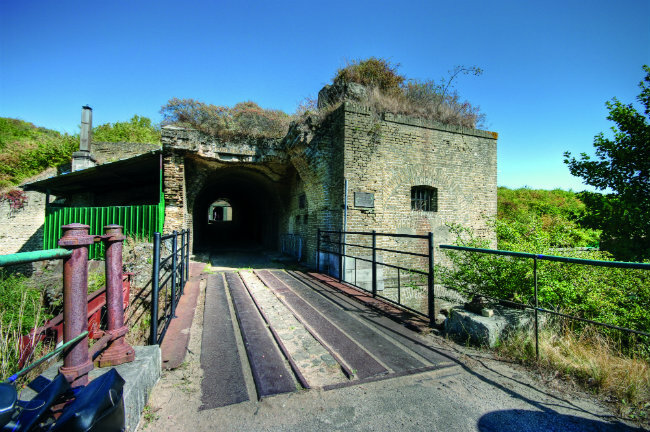 Some of these reminders, like the shipwrecks that dot the coastline, or the concrete bunkers that still stand sentry on the beaches, remain exactly where they were when hostilities ceased in 1945. They are too huge and too costly to move. And besides, they now serve as crude yet poignant memorials to all those who died. They might well be here for ever. Some memorials, though, are enjoying a new lease of life. On the beach at Leffrinckoucke there is a concrete bunker, sitting lopsided and half-submerged in the dunes. But it’s no ordinary bunker. 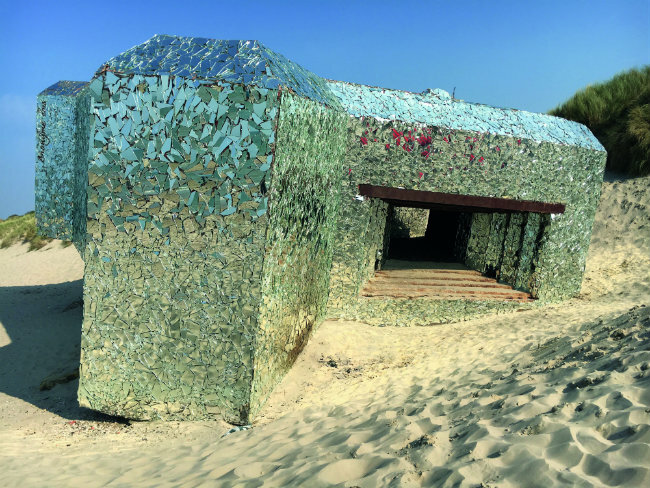 An artist has transformed it completely by encasing the whole building in a mosaic shell of broken shards of mirror. The effect is jaw-dropping. Whichever direction you approach it from, you see the sun reflected differently back at you. The artist calls himself Anonyme (his maman calls him Bertrand), and his bunker is known as Le Blockhaus Miroir. In this part of the world you can quickly contract what I call ‘Second World War fatigue’. No disrespect intended to those who served and died here but, 73 years on, it feels like it might finally be time to look forwards instead of backwards. the other is expecting to be soon), a label that grants them special government protection, placing them in the same category as the Camargue, the volcanoes of Auvergne, and the Pont du Gard. 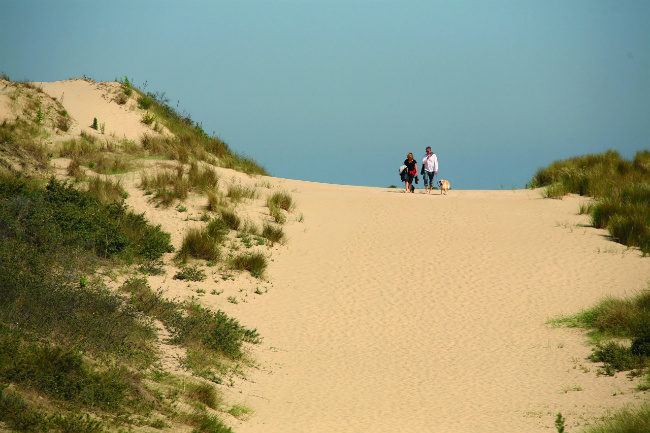 First, up on the border with Belgium, are the Dunes de Flandre, over 1,000 hectares of sandy nature reserve stretching along the beach from Dunkirk. It is a site of wide, sweeping landscapes constantly changing with the rhythm of the tides and the passing ships. 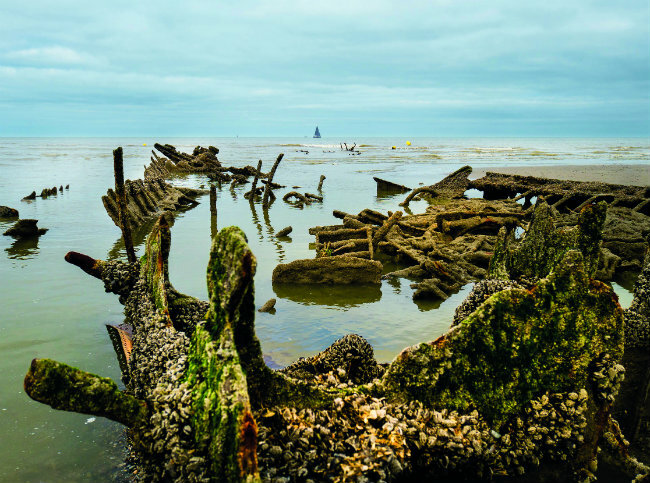 It’s here that you’ll find the grave of the MV Crested Eagle and Le Blockhaus Miroir, but you’ll also spot modern-day Franco-Flemish in search of shellfish, or using the flat, sandy beaches and rolling waves as a playground for sports such as landsailing, horse riding, windsurfing or kitesurfing. 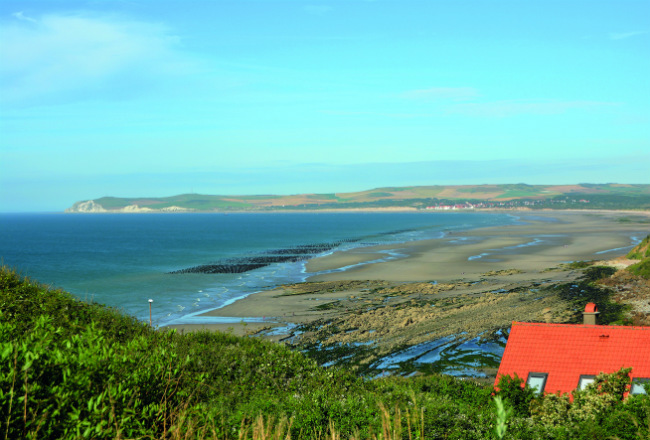 The second nature site, known as Les Deux-Caps: Blanc-Nez and Gris-Nez, sits between Calais and Boulogne, where the coastline turns and starts to head due south. 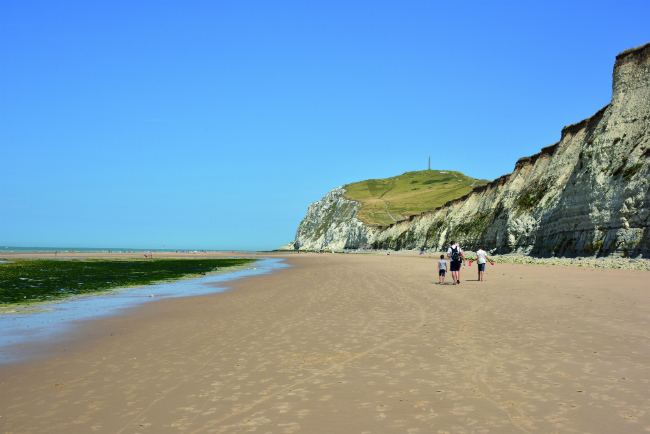 Comprised of sandstone and chalk cliffs and uplands (some still pockmarked by Second World War bombings), this is the region’s balcony over the sea, facing out towards England – in fact, Cap Griz-Nez is the closest you can be to England while still standing in France. Even on a not-so-clear day, you can see the white cliffs of Dover mirroring the cliffs on this side of the water. And from here you can watch the constant flow of ships sailing between England and France. 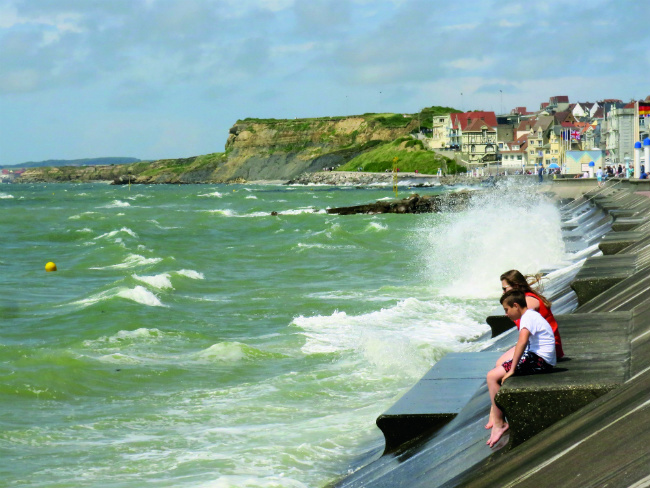 Those passing to your right will be on the Dover to Calais route; those beyond that will be sailing to and from Dunkirk. Those to your left are probably coming from or going to Dieppe. 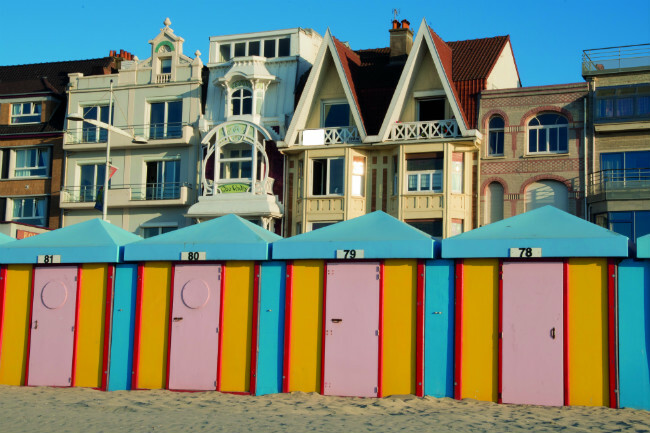 As well as boats from England, the seaside towns around the Deux-Caps have also long drawn in wealthy Parisian holidaymakers. 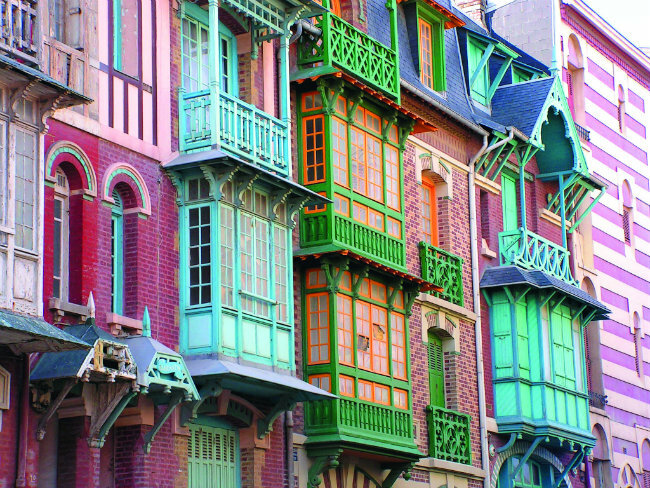 You can see ready evidence of this influx of money in the often enormous and ornate villas at Wimereux, just before Boulogne, and at Wissant, on the eastern stretch towards Calais. 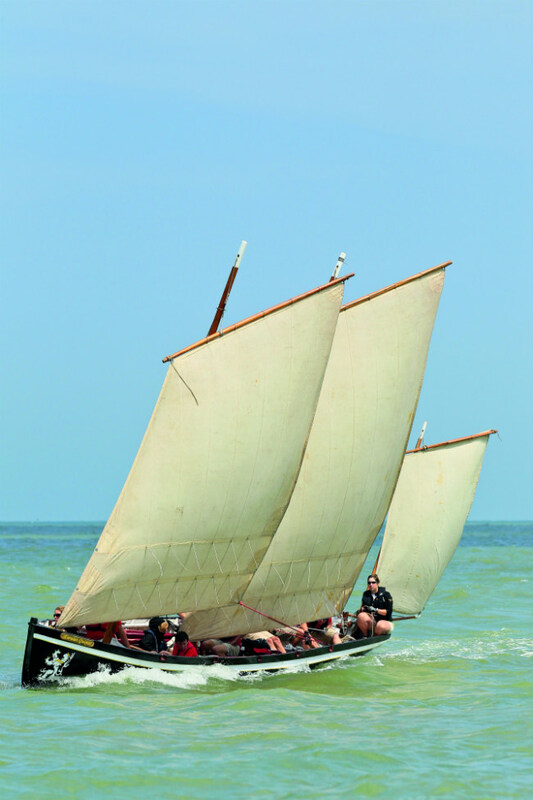 The third nature site, south of Boulogne, on a huge estuary of six rivers near Abbeville, is the Baie de Somme. 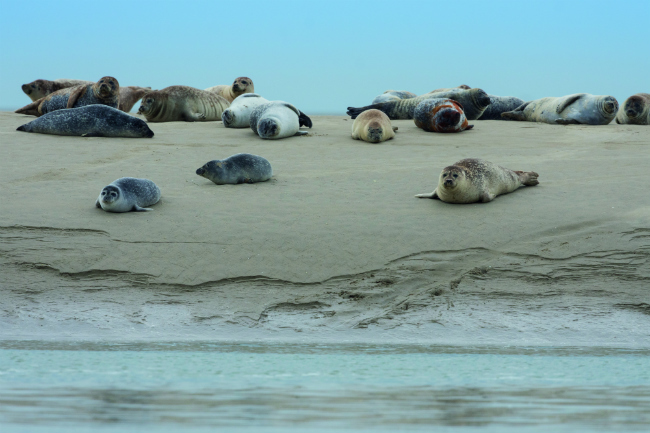 Spread over 72 square kilometres, it is visited by hundreds of species of migratory birds – and is also home to the largest colony of seals in France. A great way to explore the Baie de Somme would be to walk across it from Le Crotoy to Saint-Valery-sur-Somme (or vice versa) at low tide. It takes about three hours, and the slippery mud can upend even the most sure-footed, but with a local guide (Maxim at www.guide-baie-somme.com comes recommended) you’ll make it across to tell the tale. Unfortunately, the tides were against me on this occasion. Instead I spent a blustery morning seal-spotting from the pebble beaches with a very knowledgeable guide. The seals are protected now but, right up to the early 20th century, the locals hunted them for food and fuel. Nowadays, local meat comes instead in the form of the lambs that graze on the salty marshes that line the bay. The grass they eat gives their meat a salty taste so distinct that in 2006 they were granted their own AOC label. Other terroir products of the region include some of the herbs that grow along the shore, as well as shrimp, cockles and, of course, mussels. Near the bay is an amazing wildlife park called Parc du Marquenterre. This is one of France’s best bird sanctuaries. Laid out over 200 hectares of dunes, forests and marshland, at various times of the year it’s home to 300 or so species, including storks, avocets, spoonbills, egrets, curlews, herons, oyster-catchers, and just about every kind of duck you care to think of. I spent an intriguing afternoon with a British guide whose enthusiasm for his feathered charges was infectious. Our visit ended at the largest and most impressive of the many lookouts. Here, from inside the hide, there’s a sweeping vista across a line of tall trees hosting dozens and dozens of stork, spoonbill and egret nests. These birds, with their huge wingspans, ungainly flight and aggressive calls, resemble a colony of pterodactyls from Jurassic Park. It was a thrilling climax to the tour. They do nature properly in this part of the world. 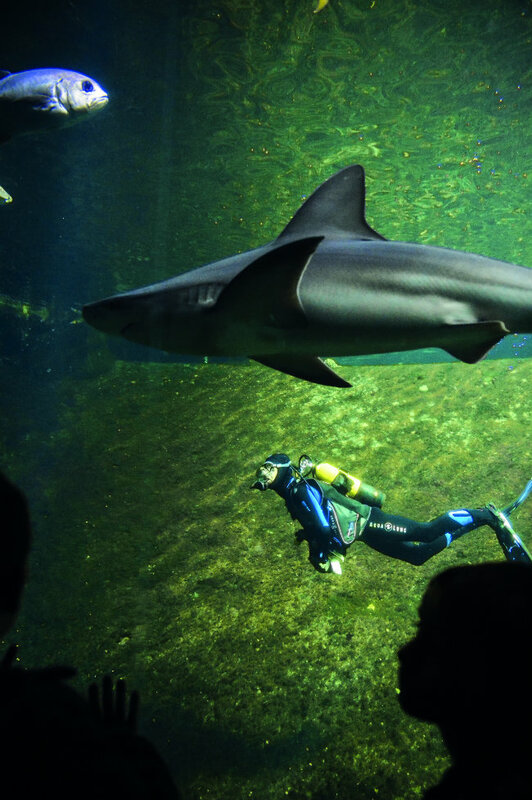 In Boulogne, for example, you’ll find Nausicaá, the largest sea aquarium in Europe, with around 58,000 marine animals sloshing around in 4.5 million litres of water. Watch leopard sharks rub fins with Argentine perch; see jellyfish dance with tentacles intertwined; and sea horses drape themselves over multicoloured corals. Admire the sea lions as they perform their aquatic ballet, or the penguins strutting up and down the edge of their pool. And at Nausicaá’s new building, you can watch hammerhead sharks and manta rays from inside an observation tunnel running 18 metres beneath the main tank. If you manage to get to just one man-made tourist attraction along this stretch of coast, make it this one. You won’t be disappointed. Everything here, obviously, revolves around seafood. Oh, and beer. 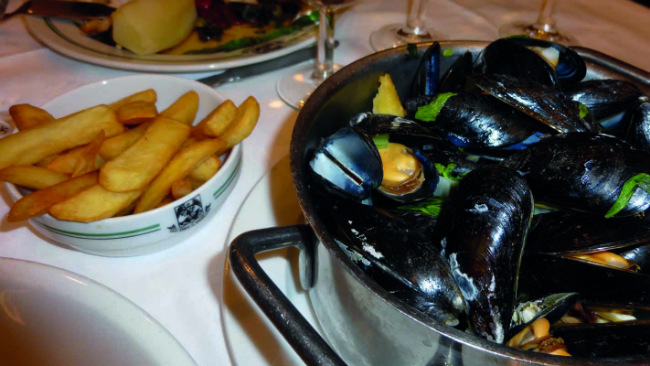 Make sure you indulge yourself with a big bowl of moules-frites, but don’t miss out on the wonderful fresh fish dishes available pretty much everywhere. 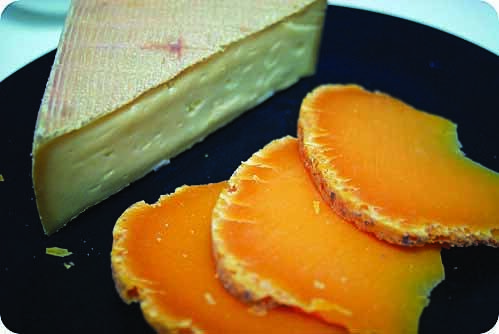 You’ll love buying direct from the fishermen’s markets, les criées. Local favourites include herring en papillote, waterzooi (fish stew), and caudière boulonnaise (fish hotpot with onions, potato, garlic and white wine). Meat is widely eaten, too. A speciality is the lamb from the Baie de Somme, which has a distinctively salty taste thanks to the estuary grass it feeds on. Andouille is also popular, but an acquired taste, to say the least. Now for the beer. You’ll find many micro-breweries dotted across the region, all producing artisanal beer of various types, much of it very rich, strong and fruity. Some breweries offer tours and tastings.